Particularly during the mass manufacture of products, the working distance between an object and a camera system generally changes little or not at all. In these cases the optical design of a vision system is relatively simple: the prevailing working distance and the desired resolution are used to calculate the optical characteristics of the system which, after the selection of suitable components and integration into the installation, then performs its function without any further adaptation. While conversion of the installation to products with a different geometry requires a one-time adaptation of the vision system, after that the installation runs optimally again without further intervention until the next change. 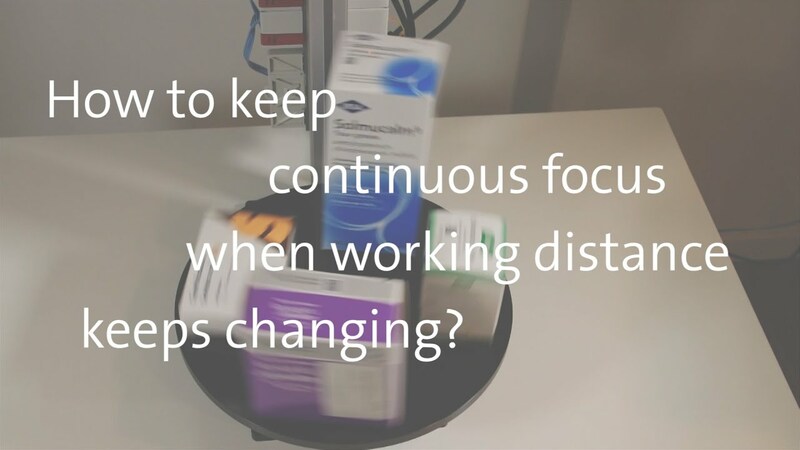 In contrast to this, however, in many applications vision systems must deal with frequent changes in the working distance. In an extreme case, the distance between the inspection plane and the camera system can change from one object to the next, which can best be seen in the example of a system for reading addresses on packages: the heights of such packages can vary continually. In order to be certain of capturing the desired information in focus, in this example the working distance to the vision system or the focus of the optics would have to be adjusted for each package, which often is not achievable with the necessary speed using mechanical means. While traditional optical systems enable focusing within certain limits according to the required distance, one or more lenses have to be moved along the optical axis to achieve this. This requires motors and mechanical guides, which limit not only the overall size and the response time, but also the robustness and service life of any solution. Principle of operation of Optotune electrically variable focal length lenses: A current-controlled actuator presses fluid through a ring from the outside into the interior of the lens, thus altering the curvature of the lens and hence its focal length. Variable focal length lenses such as the Optotune EL provide an interesting alternative for such applications. The technical basis of this is the variable curvature of a lens which consists of a membrane filled with fluid. If the pressure within the lens is altered, the curvature can be adjusted. A change to the lens radius of a few micrometres can achieve the same optical effect as the mechanical displacement of a lens by several centimetres. Optical systems can thus be designed to be more compact, often with fewer lenses and without any translational movement. The Swiss company Optotune specialises in the development of such variable focal length lenses. The company controls the electro-optical components by means of a control current from an electromagnetic actuator. The change in refractive power (measured in dioptres) is a linear function of the impressed current, is reproducible and is also free of hysteresis. The relationship between refractive power and current will vary from lens to lens due to production tolerances, and even temperature fluctuations affect the control. However, to enable accurate control of the refractive power the Optotune lenses contain a temperature sensor on which the calibration data for the particular lens are also stored. When used together with the accompanying current driver, an absolute accuracy of typically 0.1 dioptres can be achieved. Communication with the driver takes place by means of a USB connection and a serial protocol which can be implemented in various programming languages. The source code for the controller is available in C# and Labview. An alternative current driver with GigE, RS232 and analogue interfaces is available from the British company, Gardasoft. To simplify system integration for the user, Optotune is collaborating with various camera manufacturers and software companies in the field of imaging with a view to implementing integrated autofocus functions. Control of the variable focal length lens: a USB-based current driver enables accurate control of refractive power by reading calibration data and temperature from the lens. Liquid lenses offer a range of other advantages. They dispense completely with expensive mechanical drives and furthermore enable a more robust design that can work with higher precision than mechanically based optics solutions. While mechanical autofocus systems often reach their limits with respect to speed and reliability, variable focal length lenses enable focusing over large changes in working distance within milliseconds and guarantee billions of cycles. Furthermore they can be completely sealed so that no dust can enter, thus reducing the susceptibility to errors during image capture and subsequent evaluation. A further interesting feature of variable focal length lenses is that various optical materials can be used. A liquid with low dispersion with a refractive index of 1.300 and an Abbe number of 100 is particularly suitable for polychromatic imaging optics. There is practically no chromatic aberration with such lenses. For this reason, variable focal length lenses can also be combined with standard objective lenses to produce high quality autofocus systems without having to take additional measures for colour correction. Uncontrolled step response of Optotune electrically variable focal length lenses: The rise time is in the region of 2 ms and the settling time in the region of 7-15 ms.
A rapid change of working distance and resultant frequent focusing are becoming necessary more often in many application fields. The importance of variable focal length lenses is also increasing against the background of Industry 4.0: Anyone wanting to manufacture small batches down to a quantity of 1 must equip his production with solutions that can react quickly and flexibly to changing geometries of the inspected parts. There are already many examples where Optotune electro-optical components are in use. One of the most obvious applications of variable focal length lenses is the reading of 2-D codes on, among other things, objects of differing sizes in the logistics, pharmaceutical or automotive sectors. While 1-D codes can be scanned with a laser, reading 2-D codes requires a camera. This opens up additional inspection and measurement functions. Here, variable focal length lenses enable a significant expansion of the working range, e.g., from infinity down to a few mm. In a typical optical set-up, the variable focal length lens is mounted directly in front of an objective lens with a fixed focal length. There are various principles for control: If the distance to the object is known by the system, the working distance can be controlled directly in the form of an open control loop where the lens is set to the corresponding focal length. The distance information can either be provided by a suitable sensor or the system knows from its programming, which object is to be inspected next. In this mode, focus setting times of 5 to 15 ms are possible. If the distance is not known, the lens can also be operated in an oscillatory mode. At low frequencies of, e.g., 5 Hz, several images, each with different working distances, can be captured until a code has been read successfully. While this approach is not particularly fast, it is simple to implement and can be used without calibration. At high frequencies (up to some 100s of Hz) it is possible to tune through the entire working range during the shutter time. The result is an image with extended depth of field, albeit with reduced contrast as the individual “images” with different focus superimpose during the shutter time. Nevertheless, codes with good contrast can readily be recognised. The applications in which Optotune lenses have proved to be a very suitable resource also include the inspection of optical components with several surfaces such as camera lenses for mobile phones, or counting particles in a 3-dimensional fluid volume. The Optotune Model EL-16-40 installed between camera and objective lens. In applications which require a high magnification, the variable focal length lens is generally placed between the objective lens and the tube lens. The achievable z-range thus depends on the magnification factor. A typical system achieves a z-range of 16 mm with a magnification of 5x. If the variable focal length lens is operated by a 12-bit current source which permits 4096 steps, an axial resolution of 4 µm can be achieved. One application example of such a system is the inspection of printed circuit boards. Most inspection machines use mechanical drives to move a camera along the X and Y axes. Owing to deformation of the printed circuit boards, alignment problems and play in the mechanism, it is difficult to remain in focus over the entire inspection area. Even at 10x magnification, with a variable focal length lens it is possible to refocus without difficulty, thanks to a z-range of 4 mm. A sensor can also be used here to determine the working distance, provided the PCB is flat over the field of view. Alternatively, individual areas of the image can rapidly be brought into focus with autofocus algorithms. STEMMER IMAGING has been marketing Optotune variable focal length lenses for some time. In combination with all the other components required, including suitable lighting, optics and cameras, the Gardasoft current driver as well as auxiliary services such as feasibility studies or support in designing systems, the image processing specialists thus provide from a single source everything to simplify the use of this technology. Thanks to the increasing availability of electronics and software, the integration of variable focal length lenses is easier today than ever before. Visit our knowledge base and learn more about chromatic aberration.